Teaching your grandchildren good survival skills is one of the most loving things you can do for them. You never know when they might be faced with a dangerous situation, without you there to watch over them and protect them. While we would all wish to be there to protect our grandchildren from any harm, none of us know the future. There may come a day when they have to face some peril without our guiding and protective hand. 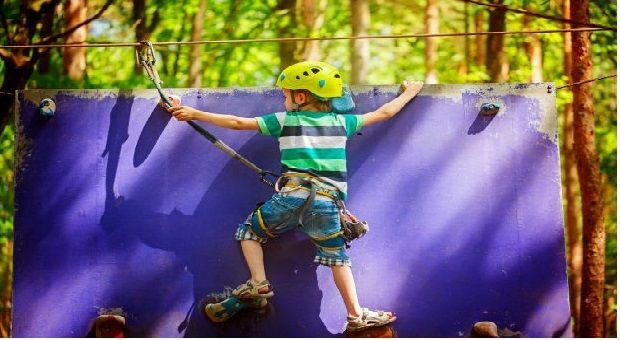 Fortunately, grandchildren learn easily and they enjoy learning about survival skills. 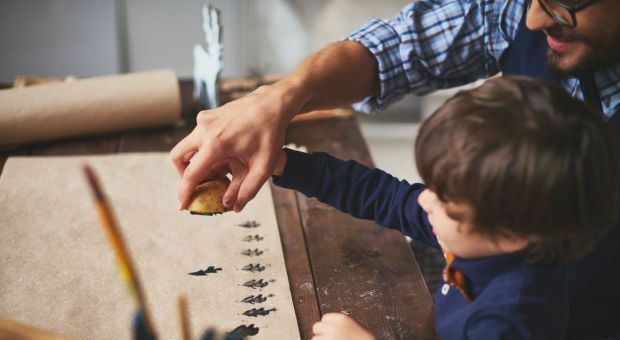 So you can readily make the teaching of bushcraft skills something that binds you together, providing quality time between you and your grandchildren. 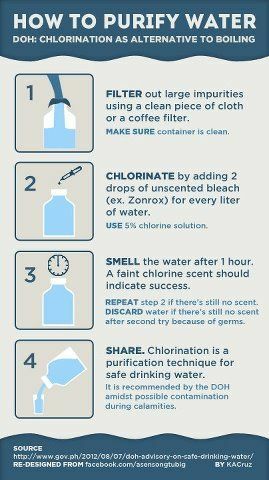 Since water is one of our top survival priorities, finding it in the wild is clearly important. Teach your grandchildren the three rules for finding water, then take them out in the wild to see if they can find any. Rule 1 – Go downhill – Water always flows downhill. Keep going downhill until you find it. Rule 2 – Look for green – Plants need water, so they will grow the best if they have water. So look for the greenest areas you can find, as you travel downhill. Rule 3 – Follow animal tracks – Most animals seek water early in the morning and just before nightfall. If you find an animal trail, especially one with fresh tracks on it, follow it downhill. It will most likely lead to water. Grandkids find it fun to be able to identify animal tracks, but it’s also a useful survival skill. If they can identify those tracks and are old enough to hunt or make snares, they will be able to hunt for food. A quick search online will give you a multitude of animal track charts that you can use for identifying tracks. Your grandkids might want to make casts of the tracks they find, using plaster of marks. If they do, it will help them to remember the various animals that they have found tracks for. Tracking a person is much like tracking an animal. The first step is to identify the track. Fortunately, we all know what a human track looks like, or at least what human shoe tracks look like. 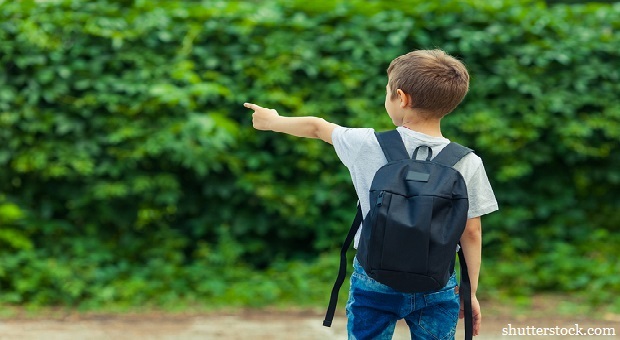 Being able to track people gives your grandchildren the ability to find you, if you get separated, or to backtrack themselves, if they get lost. Tracking is a complex skill, but one that is fun to learn. The key is in knowing what to look for. Start training your grandchildren in soft or muddy ground, or fresh snow, where you can leave a good track. Show them what the track looks like and how to figure out how long the stride is, so that they will know where to look for the next track. Teach them to recognize that there is a difference between different people’s tracks, so that they can pick out the track that they want. In many cases, partial tracks will be all they will see. The next step is learning how to think ahead, so that if they don’t see tracks, they will know where to look. If someone is following a trail, they may not leave many tracks. But it is unlikely they will leave the trail. So an occasional track is enough to prove that you’re still following the person. Where to find that track? Teach them to look in likely places, such as where the ground is muddy. They can also track, without seeing actual tracks, by looking for disturbances in the ground cover. If you are walking through the woods, there will be leaves and other organic matter covering the forest floor. Likewise, crossing a clearing or plain means walking through the grass. It is virtually impossible to do either, without disturbing the leaves or grass. Disturbed leaves will often expose lower layers of organic matter, which will be further decomposed. So, even if there isn’t a distinctive track, there will be sings that someone passed that way, simply because the grass or leaves will be disturbed. The other part of tracking is looking at the brush, not just the ground. Many times, people will break off twigs and branches as they pass, even leaving threads from their clothing on the broken ends. This is especially true when they are not following a trail, but rather pushing through the brush. Teach them to look for and identify these signs. If they can’t find any signs, it might mean that the person they are tracking has changed directions. The way to find them then, is to start from the last track they have and work outwards, making ever larger circles around that point, looking for the next sign. This can turn into a gun game, with you heading out through the woods and them trying to track you. Make it easy at first, working progressively harder as their skills improve. Always have someone with them to watch over them and ensure that they don’t get lost. A dull knife is a poor tool. Not only that, it’s a dangerous one. The extra force needed to use a dull knife makes it much more likely that you will slip and that you will cut yourself when you slip. But when walking in the wilderness, what can you use as a honing stone? A stone, of course. The best place to find a good stone for sharpening a knife is in running water. The action of the water will have smoothed the edges of the rock, while still leaving a coarse surface that can be used for sharpening. Be careful when sharpening any knife on a rock, as an incorrect angle or hitting a projection in the rock can dull the knife, rather than sharpening it. I would recommend practicing with a cheap knife, before trying this with a good quality one. It’s actually much harder to sharpen a knife with a river rock, than with a honing stone. But in a pinch, it will work. Many of the tricks that people talk about for finding north are false, like the idea of moss only growing on the north side of trees. But there is one that is true, at least for finding south. 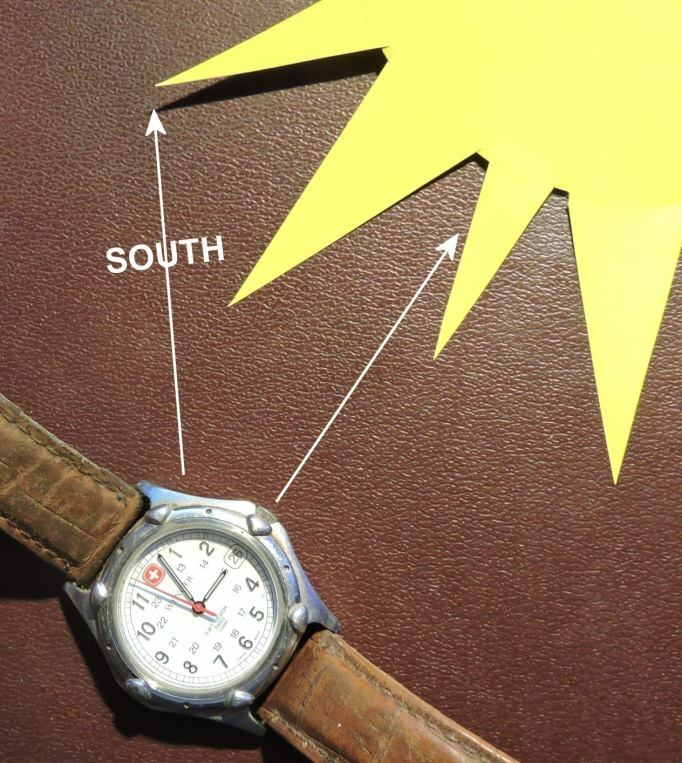 That is, you can use an analog watch to find north, just as long as the watch is set right and you can find the sun. This is just one good reason why you want to teach your grandchildren to read an analog watch, rather than a digital one. Point the hour hand of the watch directly at the sun. Then, find the point which is exactly halfway between the direction the sun is in and 12:00. That is south. In the picture below, the hour hand is at 3:00, which is pointing towards the sun. That makes 1:30 pointing south. Remember, if you are doing this during daylight savings time, you’ll need to adjust for it. That means subtracting an hour from the time on the watch. Again using the picture below, we would point 2:00 at the sun and read 1:00 as being south. Our bodies generate heat all the time. One of the purposes of clothing is to keep that heat in, by being insulation. As with any insulation, it is the air pockets trapped within the clothing that provides us with a means of holding in our body heat. But what if you don’t have enough clothing on and the sun starts going down, with the thermometer racing it to reach the bottom? You’re going to need more clothes, or at least more insulation. Dry leave and grass can be used for insulation, adding to your clothing. Simply stuff your shirt and pants with leaves and grass and then button the clothing over them. This may not work as well as a down ski jacket, but it will help to keep anyone warm. Your grandchildren need to understand that if they are lost in the woods they are generally better off staying put and letting someone find them. But that might not always be possible. If they don’t have water to drink, they’re going to need to move, so that they can find some. In that case, they need to leave trail markers to show where they’ve went. There are several different ways of marking a trail, depending on what materials are available for use. I’ll briefly discuss several of them. Making an arrow out of sticks or stones – This is probably the simplest and most obvious choice. An arrow of sticks or stones, laid on the ground or on the a trail, will indicate to anyone that someone has gone that way. Searchers will assume that the sign was left by your grandkids. Making a pile of stones – A small pile of stones, starting with a larger stone and working upwards with progressively smaller stones, is a standard way of marking a trail. To indicate a direction, a single stone is placed on the side of this pile, showing which way the person went. Stick pointer – Push a forked stick into the ground, leaving the forked end up. Then place another stick with one end in this notch and the other on the ground. The upper end of this stick should point in the direction that you are going. Bundled grass – If sticks and stones are unavailable, but tall grass is, then the grass can be used as a marker. Gather a handful of large grass, without pulling it out of the ground, and then tie it together. Bend the top end of the bundle over, so that it points in the direction of travel. Be sure to trample down or pull out grass around the marker, to make it obvious. In all of these cases, the more markers that are left behind, the better. At a minimum, one marker should be left any time that there is a change of direction or a fork in the trail. But they should also be left periodically, just to let the trackers know that they are on the right track. I would say that a maximum of 100 yards between markers is the maximum, unless traveling along an obvious, marked trail. What year cars wIll work after an EMP? Thank you for your message. I want to explain that the year is not the key factor here. Yes, it is important but you need to be on a look-out for cars that have carburettors. The ones with fuel injection have electronics that control how the fuel is managed and if they have more electronics then the chances for them to be affected by an EMP are bigger. The less electronics, the better! This was great. I have been researching “survival skills during the emergency” for kids and I think this has helped.Every morning I teach Survival Skills to the children. Because I think it’s very helpful for them.Thanks for sharing this.